In the 1970s the National Park Service reconstructed the historic late-18th-century City Tavern in Philadelphia for use as a restaurant. 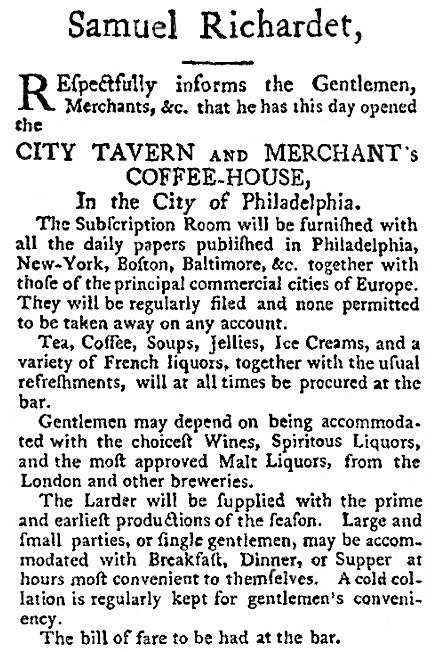 An article that describes how the tavern was to be furnished noted that originally the bar was used for more than just serving alcoholic beverages. 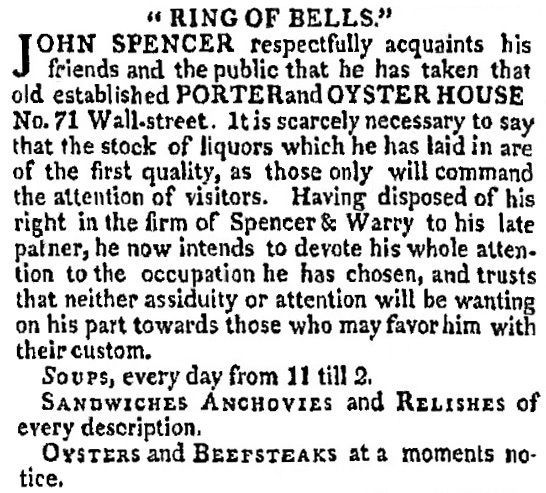 As a 1796 advertisement below shows, it also served soup which was kept hot on a stove behind the bar. Commonly, soup became available from 11 am until 1 pm each day, though some establishments offered it as early as 8 am and others kept serving it as late as 5 pm. A few times a week prized turtle soup would appear. In those places that were more than drinking spots and served full meals, soup was usually ready by 10 or 11 am, several hours in advance of the main meal. I have seen one reference to an 1820s “soup and steak establishment,” that of Frederick Rouillard who carried on after the death of Julien’s wife in Boston, as well as running a hotel in Nahant MA. His “menu” reminds me of Paris bouillon parlors that served bouillon and bouilli, the bouillon being the strained liquid in which beef and vegetables had been simmered, and the bouilli being the beef which was served with the vegetables, all of it making an inexpensive two-dish meal. Although some 19th-century Americans disliked the “foreign” French custom of beginning a meal with soup, soup soon became a standard part of most restaurant menus, as it still is. 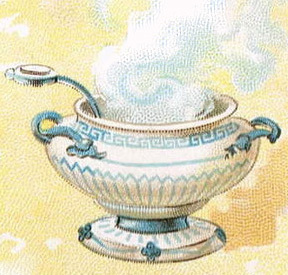 Advertisements for morning soups became rare in the 1830s, but I don’t know whether it was because it was so well-known a practice by then that there was no need to advertise or because it was no longer done. Aside from roadside inns, most eating places are found in cities in this decade. With a population slightly over 150,000 New York is more than twice as big as its nearest rivals, Philadelphia and Baltimore, but most cities are considerably smaller. In 1820 only 12 have populations over 10,000, all of them along the East Coast with the exceptions of Albany NY and New Orleans LA. Yet industrial development is underway. After a financial panic at the decade’s beginning, textile mills in Massachusetts begin large-scale production. The Erie Canal goes into operation with its completion in 1825, spurring commercial development in NYC. With the city’s expansion there is greater distance between work in lower Manhattan and places of residence, bringing more customers to oyster cellars and taverns. But New York still lags behind Boston in its supply of refined French restaurants. Big hotels begin to be established, most notably Baltimore’s City Hotel (1826), Philadelphia’s United States Hotel (1827), Washington’s National Hotel (1827), and Boston’s Tremont Hotel (1829). In most hotel dining rooms it is still the custom to put all the food – soup, meat, vegetables, puddings — on the table at once. Except for the occasional banquet, menus are not printed. A list of available dishes is chanted by waiters or chalked on a board behind the bar. Apart from eating in hotels while traveling, “respectable” women stay home. 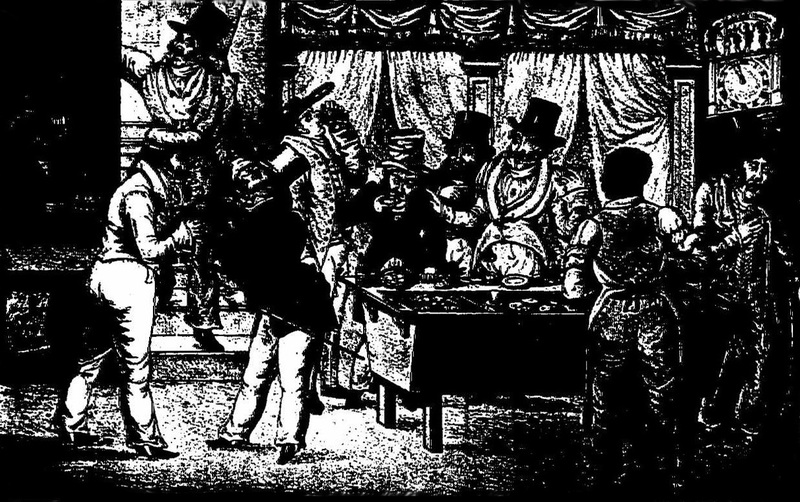 They avoid public dining spots, especially oyster houses or cellars which are associated with heavy drinking and the burgeoning male “sporting life” of gambling and frequenting prostitutes. 1820 Aiming for well-off gentlemen, Dudley Bradstreet advertises fine venison, “a warm room and the best of wine” at his Phoenix Restorator in Boston. 1821 In summer wealthy New Yorkers vacation in Saratoga Springs and environs where they enjoy Wild Pigeons, Pike, and Bass “taken daily at the foot of the much celebrated Cohoes Falls” at S. Demarest’s Mansion House. 1824 France’s marquis de Lafayette, friend of the American revolution, pays a return visit to the US and is feted with a dinner at Boston’s Exchange Coffee House which features an astonishing selection of American and French dishes. 1827 Swiss immigrants Giovanni and Pietro Del Monico arrive in New York and establish a small European-style confectioner’s shop serving pastries, coffee, wine, and liquor at 23 Williams Street. 1828 Black caterer Edward Haines opens a summertime Mead Garden on the corner of Front and Jay streets in Brooklyn NY. The nation has begun to grow westward though settlement is still mostly along the coast. Seven cities exceed 10,000 in population in 1810, rising to eight over the decade. In the largest city, NY (152,056 in 1820), commerce is on the rise, yet by mid-decade there are only eight hotels and five banks. Pigs run free in the streets. The defeat of Britain in the War of 1812-1815 does not cause an immediate end to British influence on public eateries, though there are a few French restorators. 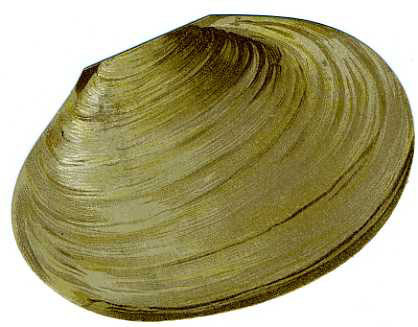 Beefsteaks are popular and oysters are served almost everywhere. Alcohol flows freely. Most eating places are also drinking places and boarding houses as well. Board can include lodging or not — some people pay a weekly or monthly fee simply for meals. 1810 With close to 34,000 inhabitants Boston, the nation’s fourth largest city, has almost 50 victuallers who run either cook shops where householders take food to be cooked or places where cooked food is served on the premises. There are also five confectioners, one restorator (Jean Gilbert Julien), three taverns, three coffee houses, and seven wine shops, some of which serve cooked food. 1814 In Newport RI, N. Pelichan announces he has opened a Victualling House and is ready to serve “good Beef-Steaks, Oysters, Turtle-Soups, etc. with Pastries, Wines and all kinds of Spiritous Liquors, of the very best quality.” He looks forward to hosting dinners and suppers for men’s clubs and societies which make up a good part of the dining public. 1815 On July 17 Hannah Julien, who has run Julien’s Restorator since the death of her husband Jean ten years earlier, informs the public that she will be serving a “fine green turtle” that day. – In Salem MA, John Remond, who is black and from the West Indies, also runs a restorator where he prepares soups, green turtles, cakes, wafers, French rolls, and other delicacies. 1818 For a day of recreation, Philadelphia families head to Greenwich Point Tavern on the Delaware River. They order a meal or simply graze on turtle soup and ice cream which are prepared every Sunday. If they become bored they take a boat ride across the river to Gloucester Point on the New Jersey side. 1819 A New York oyster cellar on Chatham Street fills up around 9 pm with patrons who drop by for fried, stewed, or raw oysters washed down with their favorite alcoholic beverages. A visitor describes the interior: “There were several tables in little boxes, covered with cloths not very clean, and having broken castors, filled with thick vinegar and dirty mustard, together with knives and forks not very tempting in their appearance.” He is also critical of the age of the patrons (too young), their appetites (too big), and the times (too extravagant). Restaurants (and their critics) have often shown concern with patrons’ health, but the focus of concern has varied widely in different eras. In the 18th century the idea that restaurants had a mission to restore health came to this country from France. The legend spread that a Frenchman named Boulanger invented the first restaurant, hanging out a signboard stating “I will restore you.” Whether or not this actually occurred — or whether he was “the first” — it is true that early restaurants in France promised to provide healthful dishes. The mission migrated to America as chefs arrived after the French revolution. When Julien’s opened in Boston the proprietor vowed to supply the infirm, convalescent, and weak with “nourishing” soups and broths, including turtle soups which, he advertised, would purify the blood. But the early French “restorators” were voices shouting in the wilderness. For most of the next two centuries Americans believed their health depended on eating meat and lots of it. In the latter 19th century and into the 20th, concern shifted to unsanitary conditions in restaurants as health departments were created, ordinances established, and inspectors dispatched. The vegetarian restaurants of the early 20th century demonstrated a renewed interest in healthy diets. Meat substitutes produced by the Kelloggs of the Battle Creek Sanitarium appeared on their tables, although breakfast cereals, whose popularity was aided by restaurant promotions, were undoubtedly the most successful of all health food products. The food conservation guidelines of World War I lightened diets, with less meat and more vegetables on restaurant menus, as well as spreading knowledge of nutrition. 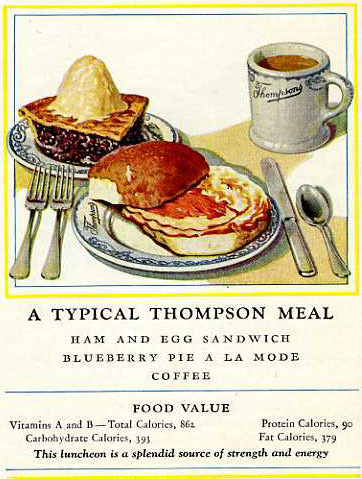 A few chains, such as J. R. Thompson and Childs, provided vitamin and calorie counts in the 1920s. But the public was not too receptive. Stockholders booted out William Childs after he gained control of the mighty lunchroom corporation and removed meat from its menus, causing sales to plunge drastically. After a prolonged beef-eating revival following the end of WWII rationing, health-conscious restaurants made a comeback as part of a counterculture critique of industrialized food. 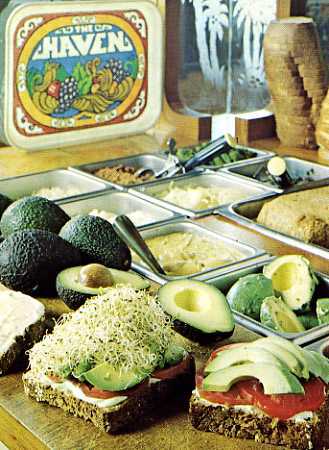 The “holy war against adulterated foods and french-fried, frozen, super sugar wastelands,” reported Mary Reinholz in the Los Angeles Times in 1971, had produced at least 25 organic restaurants in southern California, including H.E.L.P., Aware Inn, The Source, and Nucleus Nuance which served “evolution burgers,” “Virgo vege-loaves,” and carob mousse. One Los Angeles counterculture restaurant favorite, carrot cake, crossed over onto mainstream menus. Natural food eating places, such as St. Louis’s Sunshine Inn, Long Island’s Shamballah Gardens, the Haven in Honolulu, Homeward Bound in Flagstaff, and Mary’s Natural Food Restaurant in Denton TX, to name but a few, soon spread throughout much of the country, laying the groundwork for the restaurant revival of the 1980s. The American population is settled mainly along the Eastern seaboard. The largest city, New York, with almost 80,000 people, is one of only about 15 cities with more than 1,000 inhabitants. Meals are available in taverns, oyster houses, coffee houses, and French restorators. Most diners are male travelers, businessmen, or boarders, though religious societies and clubs of firefighters, politicians, or old soldiers gather for banquets from time to time. The dinner hour falls between noon and 3:00 p.m.
1800 Meat, fish, and fowl are the principal offerings of eating places, and an establishment’s quality is measured by the amount and assortment of animal protein set out on the table. 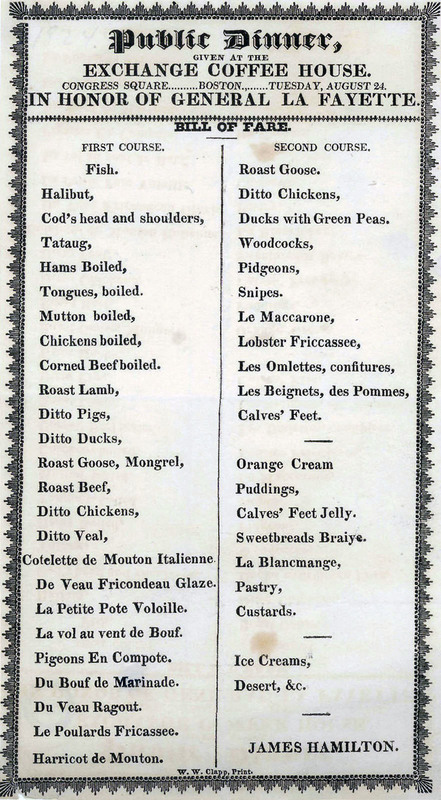 At the Portland Restorator in Portland, Maine, the proprietor proudly announces he has “potted lobster, potted eel, chicks fricaseed, and fine ragouts, beef alamode, and barbicues, sausage Bologna, Hamburgh, Naples, choice venison pastry, pork pie Cheshire, good beef steak, and bacon rasher” as well as “round of beef, fat Sirloin, turkey roast, or calf’s head boil’d with tongue & brains.” Beyond these main dishes, he supplies only soup and a few pies. Strangely, he does not mention one of the most popular edibles of the 19th century, oysters. 1801 Well-off Americans who read fashionable magazines are fascinated by the popularity of restaurants in Paris. There, it is said, “everybody” (who is anybody) dines frequently outside the home. The awkward term “restorator,” an Americanized version of restaurateur which refers either to a place to dine or to its proprietor, becomes a trendy metaphor for a publication, an essay, or an editor. 1802 Napoleon offers amnesty to his opponents and many French citizens who escaped to America during the revolution return to France, shrinking the number of skilled restaurateurs. Not all leave, however. Julien continues in Boston. 1803 In Charleston, South Carolina, a new hotel opens with a banquet room accommodating 300. 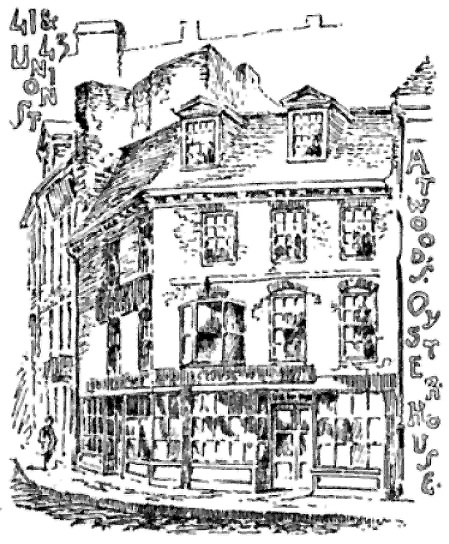 1807 The beefsteak and oyster house remains a popular sort of eating place. Turtle soup is a delicacy and restaurants place notices in papers when they are about to prepare it. On June 8 Wm. Fryatt, who has recently opened a Porter, Beef Steak and Oyster House on the corner of Pine and Nassau in New York, advertises he will prepare the last turtle of the season. 1808 Henry Doyhar of New York City announces that he will list his dinner specials in writing each day: “To accommodate those who wish to procure their Dinner …, the bill of fare, containing the dishes regularly numbered, will be exhibited every day from nine till eleven o’clock, A.M. for the purpose of engaging beforehand such dishes as may be wanted.” Since so many people are illiterate at this time, this suggests his clients are educated and probably wealthy.